THE PARALLAX VIEW is a movie which comes from a long line of 70s paranoia thrillers set in the political realm. It is 40 years old now, but it was new to me anyway. I watched THE PARALLAX VIEW (1974) on 7.2.14. It was my first viewing of the film. Joseph Frady (a long-haired Warren Beatty) is a reporter with pure ethics, an admirable sense of humor, and a potential to get himself killed. The film opens with an assassination, one deemed to be the work of a single man. Frady gets convinced, three years later, that there may have been a second gunman. He goes undercover to uncover the truth, leading to an investigate of a shady company called the Parallax Corporation. He tries to get recruited into their organization. It doesn’t go exactly to his plan. This is a paranoia thriller directed by the steady Alan J. Pakula. Two years after this movie, he would go on to make the spectacular ALL THE PRESIDENT’S MEN. To see THE PARALLAX VIEW is to see a director still honing his craft in the field of suspense. This is a movie which has a good deal of tension, but also a fair amount of unnecessary pausing (and I’m a guy who usually loves the ’70s slow’ style). Much of the most tense moments are played without music, a choice which both demonstrates the role of good music in film, and which somehow makes a man falling off a roof to his death play out as comical. 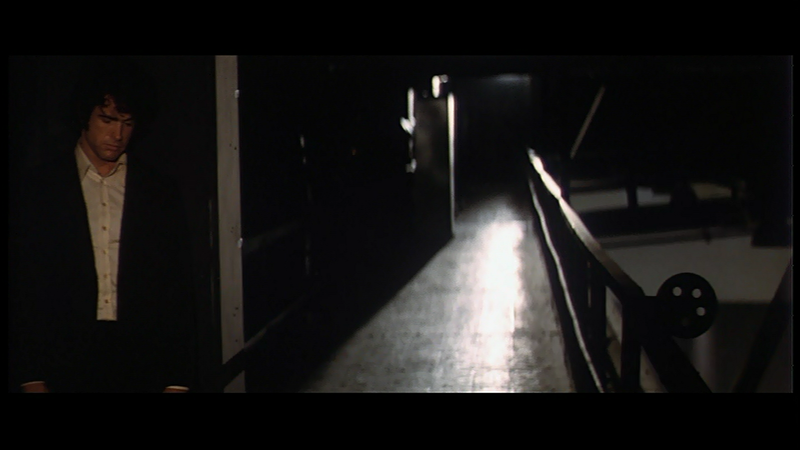 On the other hand, there are fascinating moments in THE PARALLAX VIEW as well. A long pan in on a panel of politicians making a ruling is patient and powerful (especially when it shows up again later). A scene where Beatty’s character is subjected to a ‘test’ which amounts to a gentle version of a CLOCKWORK ORANGE torture video also works surprisingly well. The use of isolation in the frame is strong, and would be mirrored two decades later by another movie I just happened to watch, ARLINGTON ROAD. Beatty is particularly good. He shines in the moments which require charisma, as might be expected. He comes across as imminently likable, even as he does some dumb things. We have hope for him in the final moments of the film, even if the movie has him doing things a modern movie hero wouldn’t be stupid enough to do. Beatty is not given much support in the acting area, but the movie also doesn’t ask much of anyone else in it. The one exception is Beatty’s boss, played by Hume Cronyn, who provides a great foil in their scenes together. Their dialogue is the best part of the script, and it sometimes can be quite good. Unfortunately, the script is not particularly strong otherwise. While it works on comedic levels and it gives a nice basic story, it fails to deliver us a believable villain or a particularly strong cause for Frady to chase. In the early 70s, coming off a decade which saw too much political assassination and governmental abuse, it is easy to see how this movie sold well. There are plenty of films from that era that stand up well today. It is not that THE PARALLAX VIEW comes across poorly now, but it isn’t a classic. ~ by johnlink00 on July 2, 2014. In the United States professional football is one of the most watched sporting events compared to other televised sports.